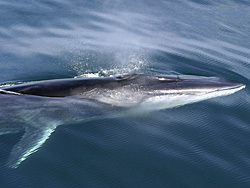 Balaenoptera is the largest genus of the Rorqual whales, containing eight species, including the recently discovered Balaenoptera omurai in 2003. The only rorqual whale which is currently not classified as a member of the genus Balaenoptera is the Humpback Whale, Megaptera novaeangliae. This page was last changed on 25 September 2013, at 20:48.